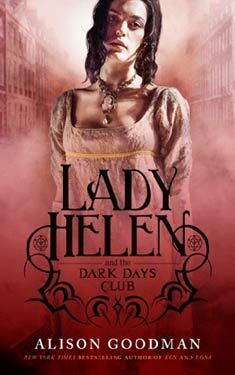 If you liked Lady Helen and the Dark Days Club you might like these books. London, 1812. Eighteen-year-old Lady Helen Wrexhall is on the eve of her debut presentation at the royal court of George III. Her life should revolve around gowns, dancing, and securing a suitable marriage. Instead, when one of her family's maids disappears, she is drawn into the shadows of Regency London. Soon the two of them are investigating a terrifying conspiracy that threatens to plunge the newly Enlightened world back into darkness. But can Helen trust a man whose own life is built on lies? And does she have the strength to face the dangers of this hidden world and her family's legacy? Set in the glittering social world of the Regency upper-crust, the Dark Days Club is a supernatural adventure that introduces New York Times best-selling author Alison Goodman's Lady Helen Wrexhall--another heroine whom, like Eona, readers can take to their hearts. Helen pressed her fingertips hard against her mother's portrait. Her aunt was still engaged with Lady Gardwell. Could she risk showing it? "Millicent," she whispered, her heart beating hard. "Look." She opened her hand, giving a glimpse of the miniature tied to her fan, then snapped her fingers shut. Her friend gasped. "I cannot believe you have brought that here." She studied Helen's face, a crease of concern between her brows. "I may not have your ability to read expressions, but I can see something has happened." Helen gave a tiny shrug. She tucked in her chin. Millicent nodded her understanding. "Well, don't let him find out you carried it here. I want my best friend at my ball." "He won't. It is just..." She stared down at her closed hand. "My mother is not here." "Yes," Millicent said. "Yes, I know." She flicked open her fan, waving it briskly as if she could fan away Helen's despondency. "I feel as if I will jump from my skin at any moment. I wish it were all over. Tell me some news that will keep me from conjuring visions of tripping over my train or bungling my curtsy." "I have just the thing," Helen said, allowing her friend to shift her mood. "Look behind me. Do you see that dark-haired man over there, standing by the fireplace?" Millicent peered across the room. "You mean the one headed over here, with Mr. Brummell?" Even as Helen turned, she felt her aunt's hand close around her arm. "Helen, dear, I believe Mr. Brummell is heading our way. Remember to smile." "Is that Lord Carlston with him, Lady Pennworth?" Millicent's mother asked, squinting. Her voice rang uncharacteristically sharp. "I believe it is, Lady Gardwell." In contrast, Aunt Leonore's tone had a sudden wariness. "You are related to him, are you not?" Helen felt the air chill markedly between the two women. Both had smiles fixed upon their faces. Lady Gardwell finally broke the loaded silence. "I would not want my daughter or myself to be in the way of a family reunion," she said. "Please excuse us. Bonne chance, Lady Helen." She sketched a quick curtsy to them both. "Come, Millicent, I see an acquaintance ahead." She caught her daughter's hand and pulled her into the crowd. Helen stared after them, Millicent's bewildered backward gaze meeting her own astonishment. "Related?" Helen said as she lost sight of her friend. "We are related to him?" Aunt Leonore touched the diamonds at her throat, her color high under the powder on her cheeks. "Well, not directly by blood. He is your uncle's second cousin. I had hoped he would have the decency not to claim the connection." So, Lord Carlston was related to her uncle. She could readily believe it; both men seemed to look upon the world with disdain. "Why did no one tell me?" she asked. "Does Andrew know?" "Yes, but it is hardly a connection that we are falling over ourselves to acknowledge. And who knew the man would come back? We all hoped he had gone for good." Her aunt grabbed hold of her arm again, the jolt shifting Helen's grip on the miniature. "Don't waste your time thinking on Carlston, my dear. It is Mr. Brummell who is important. It is he who can make you all the rage. Remember, charm and modesty. And smile!" Helen barely had time to do so before the two men stood before them. Mr. Brummell bowed, cool appraisal on his attractive face. He had broken his nose at some point, and the slight flattening disrupted the symmetry of his features. In Helen's opinion, it added a certain manliness, saving his good looks from blandness. Aunt Leonore gave a nod of acknowledgment that set her plume shivering. "Mr. Brummell, how lovely to see you again." Helen felt a ripple of movement around them. People were edging back with sidelong glances. Were they moving away in deference to Mr. Brummell, or disgust at Carlston? A quick survey of the surrounding faces gave the answer. It seemed Mr. Brummell's famous influence was not enough to make Lord Carlston palatable. Not yet, anyway. "It is always a pleasure, madam," Mr. Brummell said, bowing once more. Helen felt herself under his appraisal again, his curiosity evident in the slight lift of his brows. Then, with an elegant hand, he indicated Lord Carlston. "Lady Pennworth, may I present the Earl of Carlston." Aunt bent her neck in frigid acknowledgment. "Lord Carlston." The Earl inclined his head. "Madam." Lord Carlston was handsome, Helen conceded, in a hard, angular way that made the men around him seem somewhat effeminate. Yet there was a ruthlessness to the set of his mouth that was decidedly repellent. His skin was unfashionably tanned--both Andrew and Aunt had mentioned he had been on the Continent--and the brown of his eyes was so dark that it merged with the black pupil, making their expression impenetrable. It was very disconcerting and gave him a flat look of soullessness, like the eyes of the preserved shark she had seen in the new Egyptian Hall. Helen lifted her bare shoulders against a sudden chill. How apt. There could be no soul in this man: he was a murderer. And possibly an abductor. She wrapped her fingers more firmly around the head of the fan and the miniature. Just in time, for her aunt was turning to introduce the men. "My dear, allow me to present the Earl of Carlston and Mr. Brummell. Gentlemen, this is my niece, the Lady Helen Wrexhall." Helen dipped into her curtsy but did not lower her eyes as modesty decreed, instead studying Lord Carlston as he bowed. He was studying her just as closely, his gaze far too penetrating for politeness. For a long moment they observed one another. Well, he could look with those dark shark eyes all he liked. He would not find much in her face either. "Lord Carlston, Mr. Brummell," she said, rising from her curtsy and sweeping an aloof glance over them both. Andrew might have warned her to keep her distance from his lordship, but she could hardly embarrass her aunt by refusing the introduction. And it was an excellent chance to read the man. "I am pleased to make your acquaintance." Carlston was still watching her closely. "Lady Helen, it is indeed a delight," he said. "Particularly since we are related." "Distantly," Aunt said, her mouth small. Carlston smiled, and it held all the superiority of his rank. "And yet irrefutably." Aunt Leonore's mouth buckled tighter. Mr. Brummell cleared his throat. A sign to Carlston of some kind, for the Earl immediately swept a calculating gaze across the far side of the room. Helen was sorely tempted to look in the same direction, but it would mean too pointed a turn. Whatever he saw prompted no expression on his face. Lord Carlston gave away nothing. He fixed his gaze on her again and smiled. Helen fancied it was the look of a wolf before it leaped. "Lady Helen, I see that you carry a Vernis Martin fan." She clenched her hand around the fan rivet and miniature, her own smile stiffening into a rictus. Of all things, why did he ask about her fan? Her free hand found the base of her throat, as if its span could hide the flush of heat that rose into her face. "I am a great connoisseur of fans," he added. "Really? Of fans?" She kept a stranglehold on her own. "And do you have much cause to use them?" Mr. Brummell's shoulders shook as if he was suppressing a laugh. "Yes, do you, Carlston?" he asked. Aunt Leonore widened her eyes in warning. "Helen, dear, I am sure Lord Carlston merely has an interest." "I do, madam." He was lying--no doubt of it--although he gave none of the usual telltale signs of deception. No rapid blink or hard swallow. "Would you allow me to inspect your example, Lady Helen?" "It is nothing out of the ordinary, Lord Carlston," she said, rallying a smile as false as his own. Why was he so insistent? But she could not pass the fan over. What if her aunt's quick eye found the portrait? "I'm sure it can be of no interest to such an expert." "A Vernis Martin is always out of the ordinary, Lady Helen." He held out his hand. Helen lifted her chin, meeting his challenge. No, she thought savagely. No, I will not. For a moment she saw something surprising in those shark eyes. Sympathy. Was he playing some game? "Helen, show Lord Carlston your fan," her aunt ordered. "I cannot believe you are serious, sir," she said, trying to conjure the same teasing tone that Millicent used with her many admirers. "I feel sure you are funning with me." "You will find that I am always serious, Lady Helen." "Show him, my dear," her aunt hissed, the real message plain in the tilt of her head: Show him the fan so that we may be rid of him. He extended his hand toward her, his gaze steady and infuriatingly indifferent. He knew she could not refuse him. The discourtesy would be unforgiveable, and her aunt would probably wrench the fan from her grasp and give it to him anyway. So be it. Raising her chin higher, she pushed the riveted end into his hand, pressing the miniature into his palm. She drew back her shoulders, ready for discovery. Aunt was going to be furious. He flicked open the sticks, the curve of his large hand cradling the end, shielding it from sight. She drew in a steadying breath. Any moment now. He bent his head to study the painted panorama. Why was he waiting? He could obviously see the miniature--he had it in his hand--but he was not reacting. In fact, he was keeping it hidden. "A very pretty fan," he said, but she saw the tiniest of creases between his dark brows. If she had to hazard a guess, underneath all that implacable control, Lord Carlston was aghast. He looked up, the weight of his silence drawing all attention to his next words. She stayed as still as possible. If she did not move, perhaps he would just give it back. "Was this represented to you as an original Vernis Martin?" he asked. Helen exhaled. A reprieve. But why? Her aunt drew herself up, all pinched indignation. "I will have you know that the fan was a gift from her uncle, Viscount Pennworth." "A lovely gift," Carlston said blandly. He closed the fan with a snap and passed it back to Helen. Even as she took the end, she knew it was too light. The miniature was gone. Had it fallen? She glanced down, but it was not on the floor. A piece of blue riband was still caught between the sticks. Sliced clean. He must have cut it off, but she had seen no knife. Her fingers closed convulsively around the rivet. Was he looking for some kind of vaporish response? Well, he would not have it. She forced indifference into her face and saw another flicker in those dark eyes. Amusement. A surge of hot fury caught her in the chest. Why was he doing this? It did not make sense. "I believe we must make way for others who wish to make your acquaintance, Lady Helen," he said, bowing. "It has been a pleasure." He was leaving. With her mother's portrait. No! "Lord Carlston, I do hope you will visit us," she blurted, stopping his withdrawal. Beside him, Mr. Brummell paused in his own bow, eyebrows raised at her impropriety. "I mean," Helen continued doggedly, "will you do us the honor of calling on us tomorrow? Since we are family." She dragged up a smile as tight as a fist. The amusement deepened in Lord Carlston's eyes, bringing a sudden warmth to their flat scrutiny. "Since we are family, Lady Helen, I would be delighted to call tomorrow. As would Mr. Brummell." Mr. Brummell smiled, but Helen could see the irritation buried within it. "Yes, a pleasure, madam. Until tomorrow, then." It seemed that even the mighty Mr. Brummell bowed to Lord Carlston's will. "Tomorrow," Aunt Leonore echoed faintly. The two men withdrew, the crowd parting around them. Helen clenched the fan, keeping track of Carlston's straight back through the shift of bodies and undulating feathers. Never before had she felt such a strong desire to slap someone. Or worse, to scream her outrage.